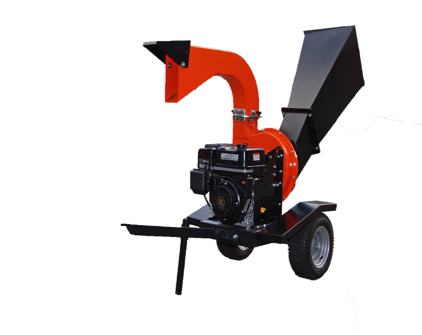 Wood chippers and shredders come in a variety of sizes, ranging from portable engine-powered units to large trailer-mounted units designed to tow behind vehicles. Their common function is to reduce branches and yard debris into manageable piles for spreading and composting. Chippers and shredders make quick work of woody branches and debris with their sharp cutter knives. These knives are more than capable of cutting flesh and bone if a worker accidentally gets pulled into the machine. Workers can also be injured by debris that is thrown from the machine during operation. It is important to know the proper operation and limitations of these powerful machines to avoid potential injury or death. A reputable dealer and an operator’s manual will help determine safe operating procedures as well as the appropriate machine for the job. Chipper and shredder selection should be based on the work to be performed, operator experience and preference. The most common types of chippers and shredders used by farmers and gardeners are smaller portable units and tractor-mounted, PTO-driven units. These are typically powered by gasoline engines and can be moved to the work location by hand or with the use of a garden tractor. These are powered by the PTO of a tractor and mounted on a three-point hitch. When operating chipper and shredder equipment, keep bystanders away from the equipment and have them maintain a clear distance to avoid the hazards of being struck by objects thrown from the blades. • Read, understand and follow all operating and safety instructions in the operator’s manual. • Become familiar with proper equipment operation including starting, stopping and engaging the cutter knives before starting. • Test all safety and emergency shut-off devices for proper operation. • Inspect the unit for signs of wear and damage. • Make sure the belts, shafts and connections are properly tensioned or tightened. • Make sure the shields and guards are in place, and the safety features are not overridden. • Refuel the engine only when it is cool. • Do not ever smoke when working around fuel sources. • Place the equipment in neutral, and if possible, disengage the knives before starting. • Do not operate the equipment in a closed building, as poisonous gases (carbon monoxide) can build up quickly. • Operate the unit only on stable, uncluttered ground to avoid potential slips and falls. Avoid operation on slopes. • Do not leave the unit running unattended. • Make sure the chute or hood is securely attached and aimed in a safe direction to control discharged material. • Keep the hands and feet away from the discharge chute and moving parts. • Make sure any PTO shafts are properly covered to avoid entanglement. • Make sure the material to be chipped is free from stones, metal and foreign objects. • Be aware of children and other bystanders in the event of thrown objects, and allow at least 50 feet of safe distance. • Do not operate the equipment when fatigued or under the influence of drugs or alcohol. • Operate the equipment only with adequate visibility and light. Keep the equipment and all accessories in good repair. Use the maintenance schedule provided in the operator’s manual, which is the best source of information regarding equipment maintenance specific to the machine. Proper maintenance will increase the life of the equipment and decrease the likelihood of safety risks due to equipment malfunction. Well-maintained equipment will result in less strain on the equipment and operator, and allow chipping/shredding tasks to be performed more efficiently. • Review the operator’s manual for recommended service. • Maintain proper oil levels and lubrication of moving parts. • Replace the cutter knives if they are damaged or excessively worn. • Listen carefully to the equipment operation to note any unusual noises, as the noises may indicate equipment damage. • Inspect and adjust all deflector guards and safety features. Replace them if necessary. • Have a qualified technician perform major repairs. • Drain the fuel tank in a safe area and run the engine on idle until it stops, before storing the equipment for extended periods. • Wear safety glasses with side shields or goggles to protect the face and eyes from flying debris. Also wear a face shield or screen over safety glasses to provide additional protection to the face and eyes from flying debris. • Wear ear protection to preserve hearing and protect ears from the high level of noise produced by the engine and cutting knives. • Wear leather gloves to protect the hands from cuts, splinters, abrasions and contact with sharp edges and flying debris. • Wear sturdy leather work boots or hard-soled shoes to protect the ankles and feet. Steel-toed boots help provide additional protection. • Wear pants and a snug-fitting, long-sleeved shirt to protect the skin from flying debris and to avoid being caught or pulled into the machine. • Jepsen, S.D., Michael Wonacott, Peter Ling, and Thomas Bean. Tailgate Safety Training for Landscaping and Horticultural Services: Wood Chippers and Shredders, AEX-192.1.85. Columbus, OH: Ohio State University Extension, 2006. • National Ag Safety Database: Chipper/Shredder Safety. Manhatten, KS: Kansas State University, 2006. nasdonline.org/document/1933/d001876/chipper-shredder-safety.html.